Angostura 1824 12 year Trinidad & Tobago Premium Blended Dark Rum is a popular Rum available from TheDrinkShop in 70cl to buy online. Visit TheDrinkShop for the best price for 70cl of Angostura 1824 12 year Trinidad & Tobago Premium Blended Dark Rum or compare prices on our other Rum products. Angostura 1824 Limited Reserve is a blend of the finest mature rums, hand-picked by the master blender from select casks. These rums are aged in charred American oak bourbon barrels for a minimum of 12 years and then skillfully hand-blended and re-casked. Upon the rum's optimum maturity it is hand-drawn, filtered and hand bottled. The rum itself excudes a rich bronze colour with a seamlessly smooth texture and well rounded, medium to full body. The bouquet is seductively rich with aromas of sweet molasses, vanilla, honey, spice and cognac-like notes. The palate of Angostura 1824 offers presents mouth-watering flavours of honey, fruit, chocolate, spices and herbs. The finish is remarkably long and flavour-packed. Where to buy Angostura 1824 12 year Trinidad & Tobago Premium Blended Dark Rum ? 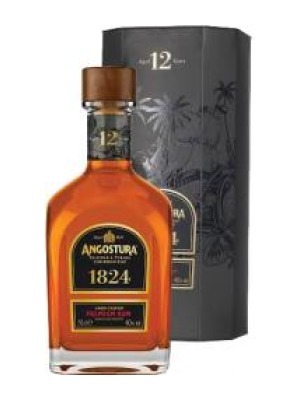 Angostura 1824 12 year Trinidad & Tobago Premium Blended Dark Rum Supermarkets & Stockists. You can buy Angostura 1824 12 year Trinidad & Tobago Premium Blended Dark Rum online in most retailers and find it in the Rum aisle in supermarkets but we found the best deals online for Angostura 1824 12 year Trinidad & Tobago Premium Blended Dark Rum in TheDrinkShop, Amazon.co.uk, and others. Compare the current price of Angostura 1824 12 year Trinidad & Tobago Premium Blended Dark Rum in 70cl size in the table of offers below. Simply click on the button to order Angostura 1824 12 year Trinidad & Tobago Premium Blended Dark Rum online now.